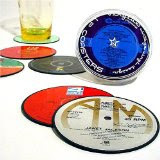 Here's a really cool gift and a fun and unique way to breathe new life into old records - Vintage Vinyl LP Record Coasters - Set of 6 . Vintage LP records are carefully trimmed to leave only the label and a small ring of black vinyl around the edge (4" diameter). Then the edges are smoothed down and the coaster is laminated to protect the label from moisture and your furniture from scuffs. Each set of six coasters is packaged in a plastic storage case. The coasters feature completely random artists from all eras of music, which makes them exciting to give and receive as a gift! They are hand made in the USA.